Orkut - Should I Use It To Promote My Site? Orkut is likely one social networking site you’ve never heard of. That’s simply because it’s not as popular here in the United States as sites like Facebook and MySpace. 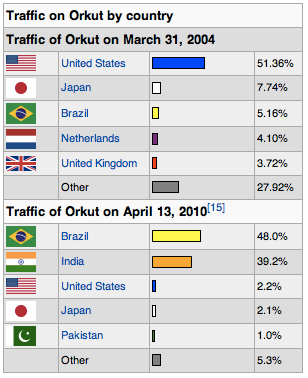 However, India and Brazil have found Orkut to be their number one social networking site. I mention it here because it is yet one more way you can help promote your online existence. The site was created by a Google employee for which it’s named, Orkut Büyükkökten. I personally set up an account here after reading about it on Google, but I don’t use it much. This is mainly because there aren’t many people from the U.S. on it. Orkut is your standard run-of-the-mill social networking site with a few minor differences compared to Facebook. One major difference is the use of themes to change your profile layout, much like MySpace. Another difference is that you can upload videos on the site and have them appear on YouTube directly. As stated above, the majority of this site’s users are from India and Brazil, so if you’re doing business in either of these locations, this site is a great addition to your existing Facebook and MySpace page. In fact, check out the traffic chart to give you an idea of where this site is currently ranking worldwide. The U.S. used to be the top visiting country when the site launched in 2004. I always say use every tool you can to help bring in more traffic to your site, but I would stay focused. If you have too many social networking sites, you won’t be able to keep up with all of them. Just pick a few that you know will serve your interests best. If you or your expected visitors are going to be coming from the high traffic countries, then use this site.